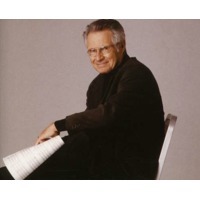 David Grusin (born June 26, 1934) is an American composer, arranger and pianist. Grusin has composed many scores for feature films and television, and he has won numerous awards for his soundtrack work. Although he has worked in many musical styles, Grusin is often thought of as a jazz or smooth jazz artist. In his soundtrack work he has forged a signature sound of largely strings- and piano-dominated, through-composed themes with a solid melodic foundation, often injecting strong jazz sensibilities and fusing pop and classical stylings.